There is my new tutorial pubblished at Vectorgraphit. 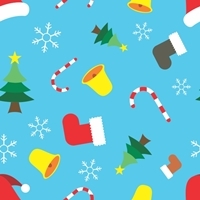 So I have decided to make a Coreldraw tutorial on how to create a seamless Christmas pattern. In this tutorial I wanna show you how to create the Christmas elements like the sock, Santa's hat, bell using the Ellipse Tool, Roughen Effect and Vector Pattern in Coreldraw. You can click here for the complete tutorial.